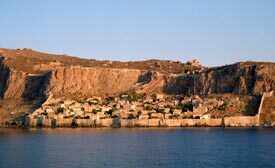 ABOVE: The lower town of Monemvasia clings to a rock on the P�lagos Sea. Monemvasia (sometimes spelled Monemvassia or Monemvasi�) is often called "the Gibraltar of Greece." The town, on the southeastern coast of the Peloponnese peninsula, is a massive walled fortress that once housed an estimated 50,000 Byzantine Greeks. Today, fewer than a hundred people live year-round on the Rock of Monemvasia; most of the town's 5,000 residents prefer the port, where cars, supermarkets, and other modern conveniences make up for the lack of historic atmosphere. My favorite Greek guidebook, the Michelin Green Guide: Greece, gives Monemvasia two stars and assigns the maximum three-star rating to its "particularly spectacular site." That's reason enough to include Monemvassia in any tour of the Peloponnese--especially if you're headed to Sparta and the Byzantine ruins of Mistras, which are only an hour and a half away.